The key to keeping your bagging scale working efficiently, whether it is filling 50lb bags or 2,000lb bulk bags is to be familiar with your specific scale. 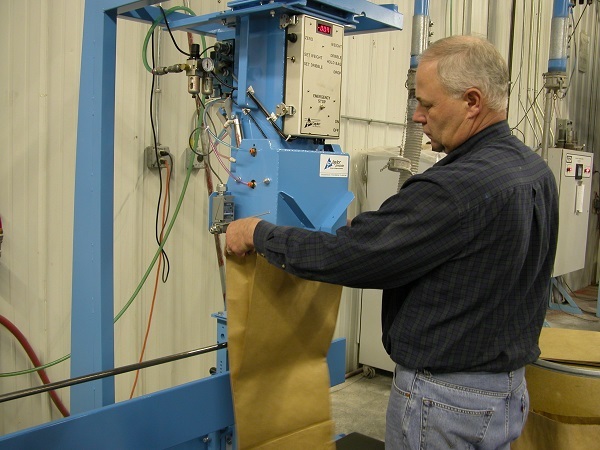 On bulk bag fillers, the regular inspection of the unit is critical to proper operation and accurate weighments. The daily routine of the operator before beginning a shift should include a visual inspection of all fasteners, linkages and pneumatic hosing. Listen to the air connections to make sure that there are no leaks. Check the incoming air pressure to verify that it is sufficient to maintain consistent movement of the slide gate, settlers and lift platforms. Use the operators’ manual of the scale to confirm the correct psi and required volume of air. The lack of consistent air pressure can create sluggish actuator movement which can result in inaccurate weighments. Drain the water from the water separator to insure that dry air is going to the pneumatic solenoids and actuators. Moisture in the air supply is one of the most common causes of premature wear on solenoids and air cylinders. The moisture can cause the rubber seals and spools of these parts to swell and in turn not shift correctly when needed. Proper cleaning of the scale is also an important part in keeping the unit working as it should. Fine materials, such as flour or dust can cause electronic circuits and switches to malfunction or give false readings. Removal of dust from the outside of the control enclosure with a low pressure air nozzle can help avoid these problems. Air pressure can be used to clean off product from mechanical linkages, solenoids, fill spouts and bulk bag hanger latches. Depending on your operating conditions, the calibration of the scale should be checked regularly. During peration, the electronic load cells are used to send signals to the weigh controller are in tension. The amount of tension determines the millivolt signal sent. As the load cells become “stretched” over time, the millivolt reading changes for the same amount of tension applied to the cell. Often recalibrating with a known weight can extend the useful life of your load cells. The weigh controller can compensate for variances in millivolt readings to a certain degree by re-calibrating the scale. If you notice your weights being inaccurate, a calibration procedure that is outlined in your manual may need to be performed. The accuracy of your bagging system can depend a lot on the product condition and characteristics of the material being bagged. Product density can change due to atmospheric conditions and hygroscopic materials can pull moisture from the air and affect the reaction times of your scale. The materials can bridge in the scale throat or flow erratically. Particle size can change during the production run and also affect product flow characteristics. Keep a close eye on the product and adjust your scale settings accordingly. A rule of thumb for keeping spare parts on hand is to separate critical spare parts vs normal wear items. Normal wear items such as bearings, air hose, pneumatic fittings and bag clamp pads or rubber transitions usually provide enough warnings ahead of time to order and replace. They also will not bring production to a halt. Critical spares such as pneumatic solenoids, load cells and air cylinders can go out in a short amount of time with varied pre-failure warnings. They should be kept in house as they can stop production when they fail. It is good practice to stock load cells for a scale that has two or more load cells. If you follow these tips your bagging scale will have a much longer operating life, and you will be fully prepared to handle any equipment failures in a timely manner. For more information on Open Mouth Bagging Scales Click Here.